After a string of successful Kapamilya events in Japan and Korea; to content-based fans’ day in Hong Kong and Malaysia; to movie premieres in Hong Kong, Malaysia, and Singapore; ABS-CBN The Filipino Channel (“TFC”) in Asia Pacific continues to bring more reasons for Filipinos in the region to celebrate and feel connected to home. TFC continues to keep overseas Filipinos updated and informed with live news program “TV Patrol;” and current affairs program “Rated K.” Filipinos overseas gain access to these shows either through cable, Internet Protocol Television (IPTV) or online (TFC.tv). These allow Filipinos to watch on their TV, desktop, laptop, or mobile devices. TFC is also now reaching out to more seafaring Filipinos via DVDs and linear channel on various cruise ships and cargo vessels. On the big screen, Filipinos in the Asia Pacific region get to watch the same quality films from ABS-CBN Star Cinema Production Inc. (“Star Cinema”) via TFC@theMovies. A recent box office hit was “My Ex and Whys,” the comeback film of the Liza Soberano and Enrique Gil’s loveteam and soon, Kathryn Bernardo and Daniel Padilla’s “Can’t Help Falling In Love”. Some theatricals screenings were personally graced by the films’ stars such as John Lloyd Cruz who flew to Malaysia for the premiere of “Just the Three of Us’” last May 9, and Kathryn Bernardo and Daniel Padilla for their film “Barcelona: A Love Untold” last September 18, both blockbuster screenings. After its theatrical release, all movies eventually become available on TFC IPTV and TFC.tv. From the screen to the stage, TFC brings a live experience of select programs in partnership with local partners. Last December, during the “FPJ’s Ang Probinsyano Isang Pamilya Tayo Grand Fans Day”, about 4,000Pinoys got the chance to personally see their favorite stars Coco Martin, Yassi Pressman, Awra Briguela and Daryl Ong. 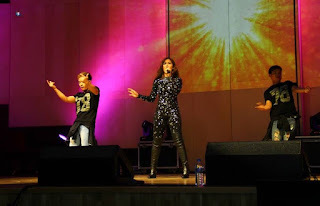 Another content-based show which TFC toured was the phenomenal “JaDine In Love World Tour”, where Nadine Lustre and James Reid made their final stop for about 2,000 Kapamilyas in Singapore with Kyla, Daryl Ong plus DJ Jai Ho last June 26. Meantime, lead stars Jericho Rosales and Arci Muñoz flew to Malaysia for a “Magpahanggang Wakas” Paskong Pasasalamat last December 4. Liza Soberano and Enrique Gil on October 30. TFC also supported local Philippine celebrations such as the Piyestang Pinoy in Taiwan with Rayver Cruz and DJ Cha Cha in partnership with Manila Economic and Cultural Office (MECO) last December 11 and Kapangywawan Festival in Hong Kong with Cruz and comedian Negi on June 12. “Kapamilya Reunion,” a virtual heartwarming Christmas reunion, Filipinos overseas get to reunite with relatives in the Philippines with the use of digital technology and social media. 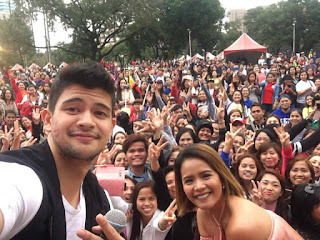 Last Dec 18, several families from Hong Kong, Australia, New Zealand, Canada and the U.S., joined the virtual Noche Buena event held at ABS-CBN head office in Quezon City, graced by Kapamilya stars like Arjo Atayde, Robi Domingo, Dominique Roque, Alexa Ilacad, Xyriel Manabat, Zaijan Jaranilla, and Nash Aguas. Star Studio Japan, now on its 10th year, brings ABS-CBN stars closer to their overseas Filipino fans via lifestyle articles which give them a peek into celebrities’ lives behind the limelight. The magazine is also a source of inspiration as it features community articles about fellow global Kapamilyas who went above all the trials in their lives. To date, TFC is and remains to be in the service of the Filipino worldwide. Aside from serving the Kapamilyasby connecting them to home through different shows, films and concert offerings, ABS-CBN and TFC are one in recognizing Filipinos who share their mission. ABS-CBN and TFC has been partners with UGAT Foundation in searching for unsung heroes through the “Gawad Geny Lopez Bayaning Pilipino Awards.” This year, the search goes to South Korea in search of these modern day inspirations. With 2017 just starting to unfold, TFC promises more reasons for every global Kapamilya in Asia Pacific to feel at home. For more updates about upcoming shows, films, and events, visit TFC’s Facebook page applicable for your area. Connect with fellow global Kapamilyas, follow @KapamilyaTFC on Twitter and Instagram.